Project Sauce: Hollandaise | "blackberry-eating in late September"
I’m reasonably certain that most people, when faced with the prospect of serving homemade hollandaise sauce, are immediately overcome with the desire to crawl underneath a table somewhere and stay there, quivering, until their guests agree to go out for brunch. Hollandaise has a reputation for being fussy – a kind of yolk-based response to the temperamental touchiness a soufflé evokes for the whites crowd. Words like “break” and “emulsify” and “scramble” haunt your vision, and the pale lemon-yellow fluffiness cloaking a restaurant-made eggs benedict feels like an impossibility. I started this project with flour-thickened sauces almost by accident. Wanting familiarity, I didn’t realize my first three sauces, the béchamel, the mornay, and the velouté, were fairly close cousins: fat, flour, liquid. No huge recipes for disaster there, aside from the possibility of clumping. But this second trimester, the egg exploration, is a little more complex. Fat comes from multiple sources now, and the egg yolks provide the protein and coagulation as well as some measure of fat. Balancing water, and acid, and dribbling in the butter just so, feels like a major project. But so long as you are in possession of arm muscles, just a little bit organized, and not in a huge rush, and, for all that is holy, not performing this for the first time in front of company, you are probably going to be okay. I used an approximation of Ruhlman’s Ratio recipe for this. Almost more useful than the recipe, though, was his advice: “Do not be afraid of its breaking. Sauces can sense fear and will use it to their mischievous advantage. I have broken many sauces and am still a happy, productive member of society and an advocate of the emulsified butter sauces. If you make them, you can and will break them” (187-88). An emulsified sauce, of which hollandaise is just one example, means a sauce that is thickened – held together, if you will – by a tenuous relationship. Think salad dressing. Remember those bottles from childhood, packed in on the door of the fridge? Remember how, during the week in between salad courses, they would slowly blurp into separate layers – oil on vinegar on water? An emulsion is when those disparate layers, unfriendly, incompatible, are coaxed together into a homogenous mix. Vinaigrette is an emulsion – perhaps one of the simplest. Fat, acid, harmonious. Because emulsions can be unstable – leave that vinaigrette too long and you end up with a layer of oil and a layer of vinegar – they need to be treated with some care. A “broken” sauce is when the butter, added too quickly, upsets the mix and causes the fat and the water in the sauce to separate. This is the deep dread of homemade hollandaise. But I’m a survivor now. It can be done. 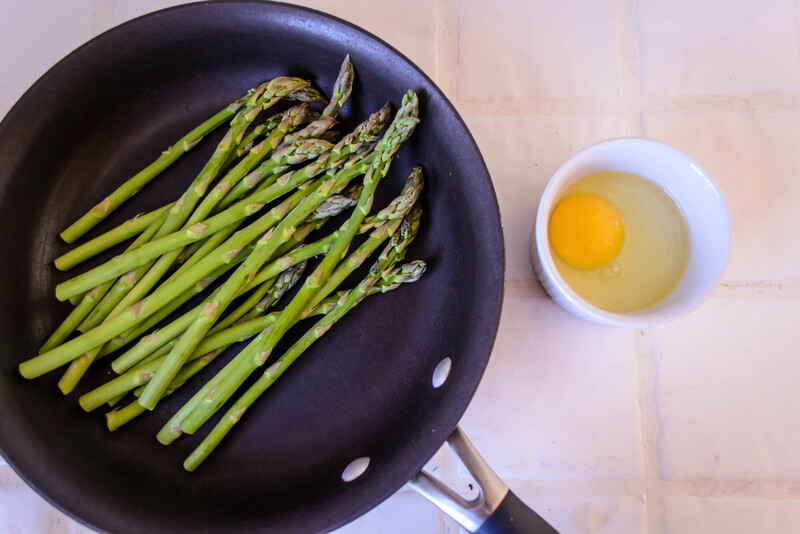 You would think, as would most reasonable people, that making hollandaise would be daunting enough, and I would choose some sensible preparation to share with you like… steamed asparagus. I went with eggs benedict. 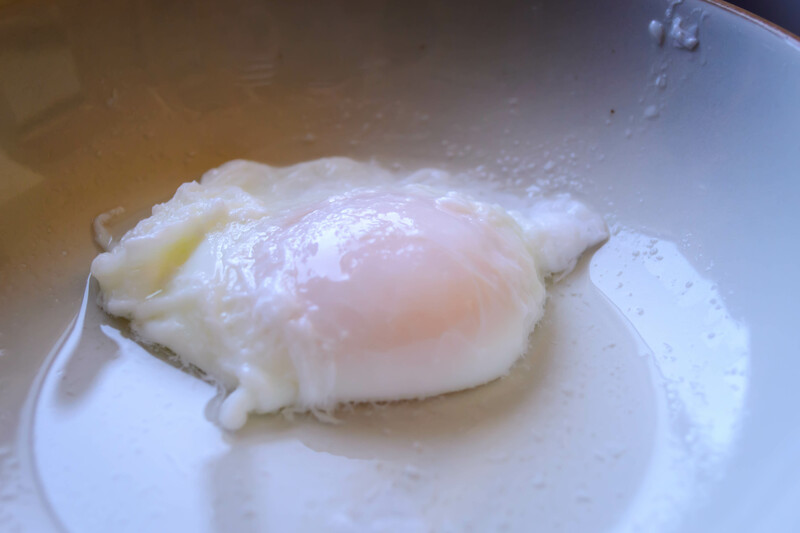 I’ve never poached an egg before. As it turns out, no single one of the components of eggs benedict is, so long as you are relaxed and paying attention, particularly tricky. The issue is having everything ready to put together all at once. Fortunately, poached eggs, once they are poached, are forgiving. Doubly fortunately, hollandaise is one of those blessed creations that actually tastes better warm than it does hot. This means, if you’re keeping score, that if it cools off a touch while you are applying that last toaster session to your English muffins, that all is not lost. This recipe will make enough hollandaise for two plates of eggs benedict. Since I was only serving me (albeit an unreasonably greedy me), I draped it across two eggs and had enough for a dish of the aforementioned steamed asparagus as well. That afternoon was a blur of food coma, but let me tell you, I’d do it again. 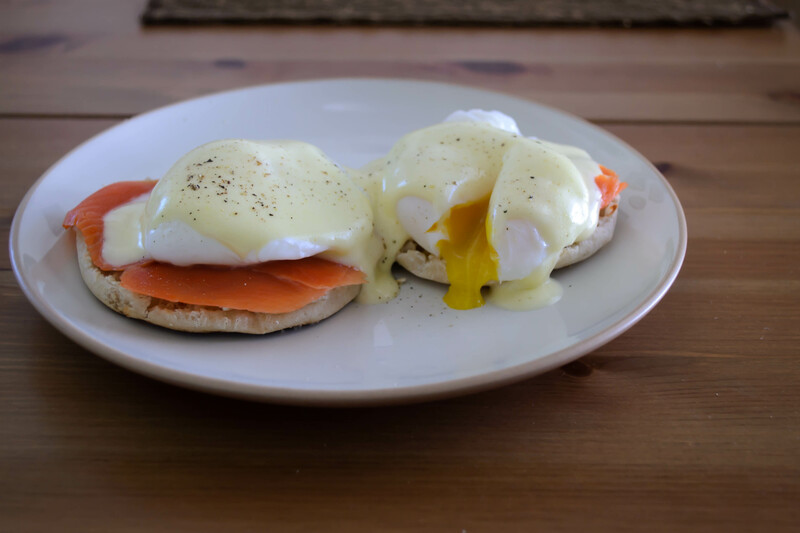 Note: if you are making eggs benedict as your vehicle for this sauce, my recommendation is to poach the eggs first (Deb has a good step-by-step recipe which I used pretty much verbatim), then set them aside in a bowl while you make the hollandaise. When the hollandaise is ready and you’ve pulled it off of the pot of water, pop the English muffin into the toaster and slip the poached eggs into the pot of hot water you just vacated. While the muffin toasts, the eggs will heat up and the hollandaise will cool slightly. By the time you’ve draped some smoked salmon or Canadian bacon across your muffins (I’m partial to the salmon, though. It’s like velvet), the poached eggs should be warm enough to serve, and hey presto! Eggs benedict for brunch, just like that. Heat water in a medium pot to a bare simmer. It does not need to be boiling. While the water heats, combine vinegar, water, and salt in a glass bowl. Stir or swish to dissolve the salt. Add the yolk and whisk up a bit. Place the bowl over a pot of hot water, but don’t let it touch the water. 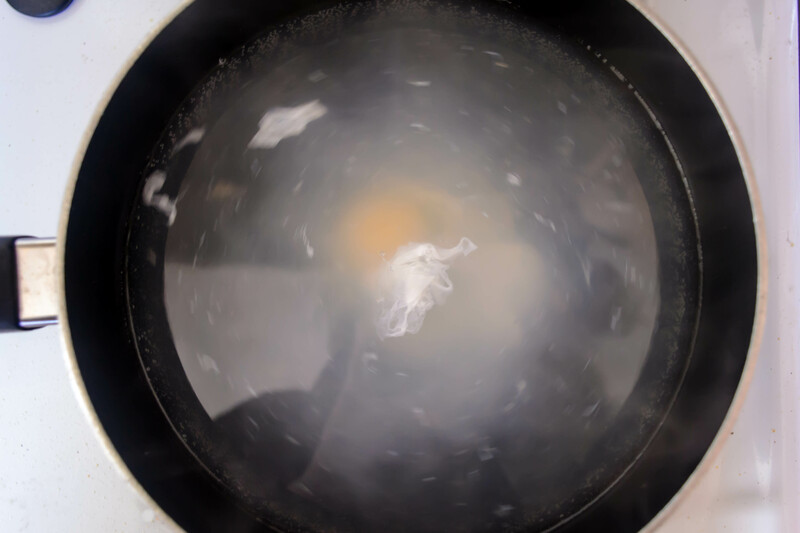 Keep the water at a low simmer; we are not looking for a rolling boil, or even a boil at all. This should be a gradual cooking process, so the yolk doesn’t scramble. Bring the water to a simmer, whisking the mixture constantly. First there will be small, fizzy bubbles, but as you keep whisking the yolk will get very pale in color and start to gain volume. It becomes quite fluffy and starts to look like, well, like hollandaise sauce. This may take 3 or 4 minutes, or it may take more like 7 or 8. It depends on the speed and ferocity with which you whisk it. When the sauce volume has at least doubled, turn off the heat and start drizzling in the melted butter, slowly, whisking CONSTANTLY. The sauce will get thick and creamy. If it suddenly looks really shiny or like it’s going to separate, whisk hard, lay off on the butter for a few seconds, and add another teaspoon of water. After you’ve added all the butter, and the sauce is thick, creamy, and rich looking, add the lemon juice and pepper, if using. Season to taste with salt, if needed. To prevent overcooking and unattractive clumpiness, remove it from the pot of water until ready to serve. Serve over poached eggs or steamed asparagus, warm but not piping hot – the flavor intensifies as it cools a bit. 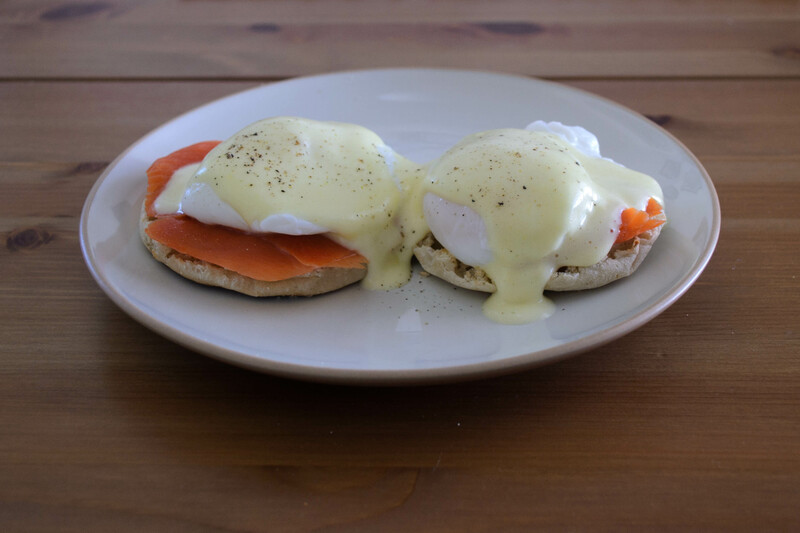 This entry was posted in eggs, Gluten-free, Recipes, sauce and tagged butter, eggs benedict, hollandaise, project sauce by Chelsea. Bookmark the permalink. This looks great! I have an immersion blender combo that has a whisk attachment – do you think this would work or move too quickly? I know, right? The lure of eggs benedict is so strong…. To be honest, I’m not sure whether the immersion blender contraption would be too much. I was whisking pretty vigorously, so it seems like maybe on a low speed it would be okay? I say try it. With just one yolk and less than one stick of butter in the mix, even if the sauce broke it wouldn’t be a major investment. Let me know how it goes, if you give it a shot! I’d love to hear your experience. That breakfast looks PERFECT. Everything about it, from the gorgeous poached eggs to that creamy hollandaise. I can’t believe this was your first poaching attempt! Well done! Thanks, Laura! Things looked dicey in that pot, but once I scooped the egg out from all those weird, flyaway ropes of white, it looked like a proper poached egg! Glad you enjoyed. Pingback: Project Sauce: Peppercorn Crusted Pork Tenderloin with Plum Gastrique | "blackberry-eating in late September"